FRANCE: The support of a pro-vape lobbyist at the Ministry of Health? After years of ignorance and silence, would the French government be ready to open up on the subject of the e-cigarette? According to our confreres Entreprise.news", End of February, a new person joined the communication team of the Ministry of Health. 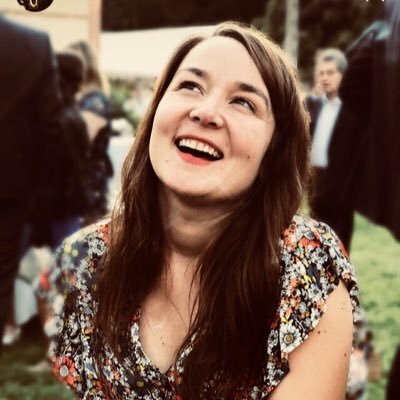 It is Jeanne Bariller, Former consulting director at the consulting / corporate communication division of the Havas Paris agency, but also former collaborator of Xavier Bertrand known for his favorable position on the vape. MORE OPEN COMMUNICATION ON VAPOTAGE? Recently, an Official Journal decision announced arrivals to the government of Jeanne Bariller et Maxime Boidin, respectively adviser in charge of press and communication at the Ministry of Health and adviser in the cabinet of the Secretary of State at the same ministry. Regarding the first mentioned, besides the fact that she had been in charge of press relations in the cabinet of Xavier Bertrand when he was Minister of Labor, Employment and Health and its communication to the National Assembly, the past of Jeanne Bariller spring today. Invited at Europe 1 the 1er June 2018, Agnès Buzyn explained that the electronic cigarette was an object of care like any other as well as patches or chewing gum. The minister wanted " promote anything that can help stop smoking » while confessing only not very well know the toxicity of the electronic cigarette in the long run. » Agnès Buzyn concluded by stating that the electronic cigarette was " clearly less toxic than tobacco. " 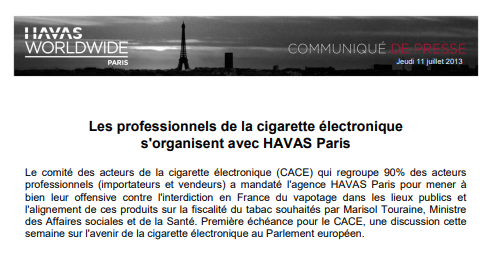 Amazing but logical position when we know that in 2013, the committee of actors of the electronic cigarette (CACE), which gathered all the same nearly 90% of professional actors between importers and sellers, mandated the agency Havas Paris, that Jeanne Bariller will join in 2015, for " carry out its offensive against the French ban on vaping in public places and the alignment of these products on the tobacco taxation desired by Marisol Touraine " at the time Minister of Social Affairs and Health. The 17 July 2018, the group Havas Paris was chosenfollowing a call for tenders against four other agencies for the conception and the implementation of the institutional digital strategy as well as the website » Public Health France, the national public health agency that reports directly to the Ministry of Health. The agency includes, among others, the Institute of Health Surveillance, the National Institute for Prevention and Health Education and the Health Emergency Preparedness and Response Facility. The contract is for a period of one year, renewable three times a year in case of good results. The market is, for its part, 2,3 million euros. The Havas Paris group will have the task of leading the digital communication of the Ministry of Agnès Buzyn to information on the observation of the health status of the French, the promotion of health but also on issues related to the prevention and education and health watch and alert. ENCOURAGING BUT NOT FORCE DECISIVE! As the precise Entreprise.news « From there to say that we already know that it will be the position of the government, the Ministry of Health on the subject of the e-cigarette, there is only one step ... Yet we can not forget the many disappointments that the e-cigarette sector has experienced with the changes in the government. « Words fly away, writings remain If this is not always of great value to politicians, it will always be time to remind the people concerned if the decisions taken are not in line with the old written declarations. Previous: VAP'NEWS: The e-cigarette news of Wednesday 13 Mars 2019.